Although I've seen photographs of Aughlish circles and alignments, I never really got a feel of the site from those images. The main purpose of my trip to Dungiven was to see the megalithic complex at Ballygroll. 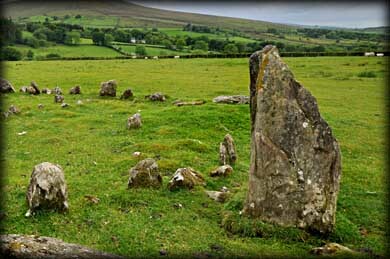 But before heading for there I stopped at the stone circles at Aughlish. WOW! What a superb complex of stone circles and alignments. 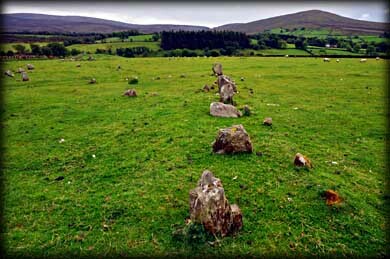 This site is typical of the bronze age stone circle complexes located around the Sperrin Mountains. 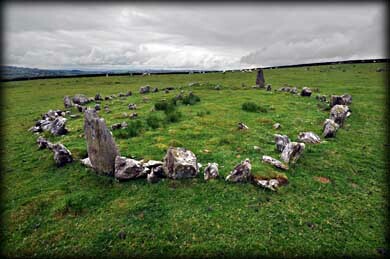 Beaghmore in Tyrone is probably the most well known of this type of mutiple circle and alignment complex. The first circle I came to as I walked in a northerly direction up the field is probably the finest of at least five circles present. It is about 12.5 metres in diameter and is composed of over forty low stones with a 1.5 metre high stone in the southern arc and a 1.5 metre high outlier standing just outside the northern arc (see top two images). All the circles appear to have an outlier present. I then followed a tangential row up the field to a pair of circles (See image above). To the east of these appeared to be the stones of half a circle that runs up to the field boundary. North of the pair of circles is a small circle with an outlier standing outside the southern arc (See image below). The row pictured left seems to lead the eye towards the notch in the distant mountains. Standing at the western extremity of the field is a single standing stone. 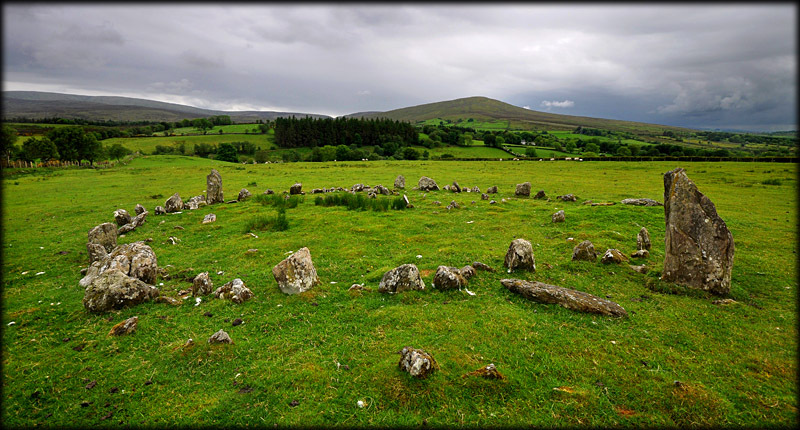 I never did see the megalithic complex at Ballygroll due to the deluge of rain that followed my visit to Aughlish, but I am delighted I saw this amazing group of Mid-Ulster circles. Strongly recommended. Situated: From Dungiven head west on the A6 (The Main Street). After 0.5 miles turn left onto Feeny Road. Then 2 miles turn left onto Altinure Rd. After 0.3 miles turn left onto Rallagh Rd. There is a wooden style leading into the field on your left, 1.5 miles down this road. Discoverer Map 7: C 6613 0428. Last visit June 2013.